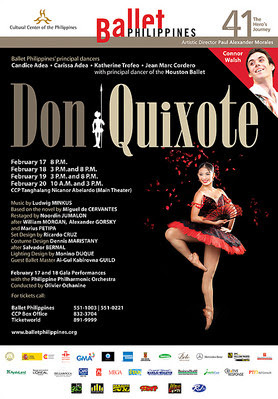 Ballet Philippines takes a giant leap this February with a lavish and opulent production of the famous ballet classic, Don Quixote, at the Cultural Center of the Philippines (CCP). Derived from an episode of the novel by Spanish author Miguel de Cervantes, this adaptation follows an aging gentleman who had deluded himself to be a knight-errant rescuing damsels in distress, and the adventures of young lovers Kitri and Basilio. The story culminates with the most popular dance duet in ballet history, the couple's grand pas de deux. The grand production brings together the world's premiere and award-winning artists led by Houston Ballet's principal dancer, Connor Walsh, who will be performing alongside the Company's lead dancers on a limited engagement as Basilio. Walsh was educated in some of the most renowned schools in America, including the Kirov Academy of Ballet, Harid Conservatory, and Houston Ballet's Ben Stevenson Academy. During his time in the latter, he has received the prestigious Rudolf Nureyev Foundation Scholarship and the Ben Stevenson Scholarship awards. In 2004, he received the first annual gold award from the National Foundation for Advancement in the Arts and the Award of Encouragement at the Shanghai International Ballet Competition. Walsh will grace the stage in gala performances on February 17 and 18. 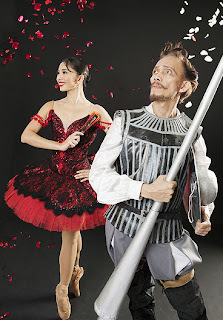 Setting the stage afire as the spirited Kitri is Ballet Philippines' own gem, Candice Adea, silver medalist in the 2010 International Ballet Competition. Alternating with Walsh is 2010 International Ballet Competition semi-finalist and Ballet Philippines principal dancer Jean Marc Cordero. Katherine Trofeo and Carissa Adea alternate as Kitri. Ai-Gul Gasina from the Australian Ballet will coach the Company dancers in the reinterpretation of the epic masterpiece. Trained at the Vaganova Choreographic Institute in Leningrad, Gasina has danced, among others, the roles of Ronald Petit's Carmen, Aurora in Sleeping Beauty, Kitri in Nureyev's Don Quixote, Michelle in Gillian Lynne's Fool on the Hill, and Valencianne in Helpmann's Merry Widow. She has, by invitation, taught at The Royal Danish Ballet, the Houston Ballet, and the Hong Kong Ballet. The Philippine Philharmonic Orchestra, under the baton of conductor Maestro Olivier Ochanine, will bring the musical score of Leon Minkus to life. The production is a restaging by Ballet Philippines choreographer, Noordin Jumalon, using the versions of Marius Petipa and William Morgan. February 18, 3:00 p.m. and 8:00 p.m.
February 19, 3:00 p.m. and 8:00 p.m.
February 20, 10:00 a.m. and 3:00 p.m. Ticket prices on February 17 and 18 gala performances are from PHP 1,000 to PHP 5,000. Regular prices for matinees are from PHP 200 to PHP 800 and evening shows from PHP 400 to PHP 2,000.